This past Saturday, April 24th, I teamed up with my friend and owner of The Lab, Zack Johnson to play at UVM’s Springfest. 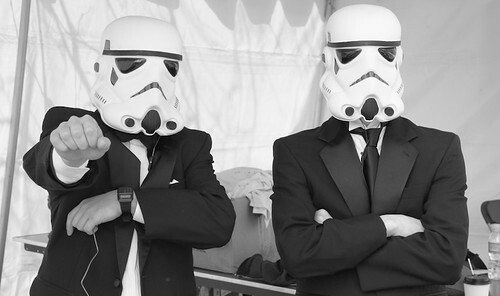 We donned our Stormtrooper helmets and tuxedos and proceeded to rock the denizens of Burlington the right way. All without being able to see or hear much at all. Those helmets don’t allow for much of anything as far as sight and sound go. Props to Josh Franklin on the dope photo. Since before MSTRKRFT was event confirmed to play at Springfest, an annual one-day music festival event put on by the University of Vermont, we had been putting a bug in the ear of the people putting on the event that we needed to open for this event. Through much hard work and negotiating, we finally got the best slot that was available to us, and so began a new chapter in Springfest’s history. The event was packed full of acts. My friends DJ Dan and DJ cRAIG mITCHELL were both on the bill, and that was a blast. Theophilus London played the set before ZJ and I. After we went on, Ingrid Michaelson played, then MSTRKRFT held down the headline slot. People have been asking me for the set that we put together for Springfest. Ask and ye shall receive kiddos. More pictures and videos as they come about. Thanks to everyone who came out! This is only the beginning.